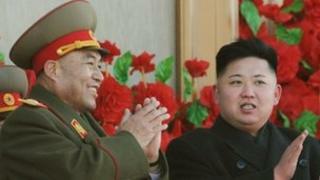 North Korea has appointed a new vice-marshal, Hyon Yong-chol, the official KCNA news agency says. The move comes a day after the army chief, Ri Yong-ho, was removed from his post "due to illness". The decision was made by the Central Military Commission of the Workers' Party of Korea and the National Defense Commission of North Korea, KCNA said. The statement did not say if Mr Hyon was taking over the top military job from Mr Ri. Little is known of Mr Hyon, who is reported to be a member of the party's 120-member central committee. He is now one of several vice-marshals in the army. Mr Ri, 69, who was also a vice-marshal, was vice-chairman of the powerful Central Military Commission and held top posts in the ruling Workers' Party. Mr Hyon is believed to have been appointed a general in 2010 but is not currently part of the military commission chaired by young leader Kim Jong-un, reports said. He appears to be the latest rising star in North Korean politics, says the BBC's Lucy Williamson in Seoul, and analysts are waiting to see whether he will replace Mr Ri as army chief. Ri Yong-ho's removal took many North Korea observers by surprise, with widespread scepticism at the official explanation for the move. He was seen as a key figure in the recent transition of power from Kim Jong-il, who died in December 2011, to his son. He was made army chief three years ago under Kim Jong-il and appeared regularly at state occasions beside the late Mr Kim. He was also one of seven top officials to accompany the younger Kim as he followed the hearse containing his father's body at his state funeral. A spokesman for South Korea's Unification Ministry told reporters that Mr Ri's departure was "very unusual". Some analysts say ''illness'' is not an uncommon pretext in Pyongyang when a member of the elite leadership is removed. Now in power for six months, Kim Jong-un is rumoured to be promoting a new generation of officials, and is being carefully watched for signs that he will take the country in a new direction, says our correspondent.